Rick and the older boys went to Philadelphia today for a baseball game. Zack gets to go to his first gaem on Saturday (minor league). He's excited but doesn't quite know WHY -- I think he's just excited to be with his big brothers. I worked with some great beads today, including some from Cassie Donlen lampwork I adore. 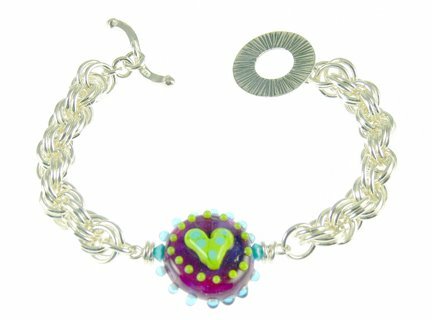 If you haven't seen her jewelry, click her name and go look -- her sense of whimsy and color is just terrific, and I love it all. A bunch of us are joining the Y next week -- I'm anxious to do some Pilates or Yoga classes. My flexibility used to be terrific but now, yikes. Plus they have an indoor pool, so laps will be a good thing. And Zack can continue swim lessons (he's a water bug) and eventually I hope to get back into teaching classes. I miss all that. Sent off a bunch of jewelry to be photographed for next year's jury slides. Applying to shows is like applying to college, I tell you! I sent off some different things this time, including some of my chain work. I just got a huge new supply of rings, so I'll be making chain like crazy the next couple of weeks! 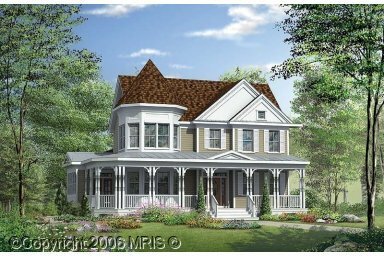 Tomorrow we're going to go look at a house in Centreville, MD, a little closer to Rick's work. It has 3 acres (can you say, lawn service?) and it's big, 3500 sq ft -- master suite up and down, which is a must in case we have long-term guests, and from what I could see, really nice. NO idea if it will be THE house but the price is right and can't hurt to look. We're perfectly happy where we are, just know that it's not the LAST house, you know? but the lot in MINISCULE. This subdivision is being built with these terrific houses, but the lots are so small, you could trade a cup of sugar between windows. Yikes. And we have such specific criteria that we aren't willing to bend on -- I guess since we don't HAVE to move, we're being ultra-picky. But that's ok! Home is where the heart is -- really and truly.